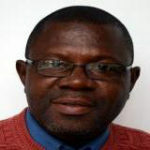 Daniel B. Sarpong, Ph.D. is an Associate Professor and the Chair/Head in the Department of Agricultural Economics and Agribusiness, School of Agriculture, College of Basic and Applied Sciences, University of Ghana. He was formely the Vice-Dean of the then College of Agriculture and Consumer Sciences, University of Ghana. He teaches courses at both the graduate (MPhil/PhD) and undergraduate levels in Microeconomics and Macroeconomics, Research Methodology and Statistics and (Applied) Econometrics and Scientific Writing and Seminar Delivery. He has over 60 published journal articles, technical publications and other reports. Over the last decade and a half, he has supervised several PhD, M. Phil and Bachelor students for their theses and dissertations. He provides scientific analysis of socio-economics of agricultural households and their impacts on the macro-economy. He has collaborated and continues to collaborate with several research institutes (both home and abroad) and universities including IFPRI, Tufts University, University of Georgia, Global Alliance for Improved Nutrition (GAIN), IDS-UK, ODI-UK, Leuven University (Sweden). He has also collaborated with others on several baseline and other impact assessment and evaluation studies.